Have your alloys seen better days? Are you thinking of splashing out on a new set? Have you seen how much they cost? Of course you have, that’s why you’re here. Why buy new, when you can repair for a fraction of the price and get the same result? We provide a specialist alloy wheel refurbishment service in and around Essex, and our top quality work is guaranteed to get your rims back to their former glory. If you aren’t satisfied with the result, we will continue working until you are. 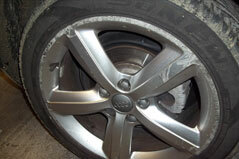 Click here to find out more about our alloy wheel repair services. 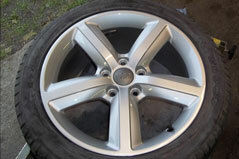 Chris did a brilliant job of refurbishing my 17″ five-spoke alloys. They had been badly kerbed by a previous owner. After Chris’s hard work on them you would not know they were ever damaged – the result was outstanding. Chris also showed-off his skills in bodywork repair by treating some superficial scratches to the pearlescent paintwork on the bonnet and offside doors – again the result was “back to new”. Chris is obviously a perfectionist like me. I’ve been disappointed by the standards of many people in other trades but finally someone did some work for me that I feel over the moon about. To top it all off, Chris is a genuinely decent, friendly and helpful guy! I simply cannot recommend Chris highly enough. 10/10. James, Audi A3 owner from Kingston-upon-Thames, Surrey. Bodywork need buffing? Do you have dings or dents that don’t belong? There’s nothing like the feeling you get when you return to your car and find a huge ugly scratch across your paintwork. You know it wasn’t there when you left, but the space next door is empty now, and they didn’t even bother to leave a note! We can provide you with a range of accident repair services to restore your bodywork’s beautiful shine. From scratch removal to full resprays and refinishing, when you bring your car to our Essex based body shop you know you’ll be leaving it in safe hands. Simpson Autocare can provide you with a competitive quote for any required work and all work undertaken will be completed to a high quality standard. 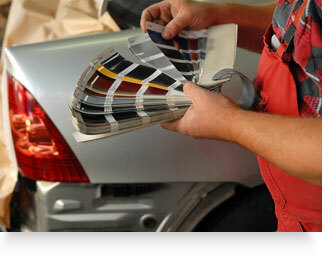 Click here to find out more about the range of bodywork repair and paint services we offer.